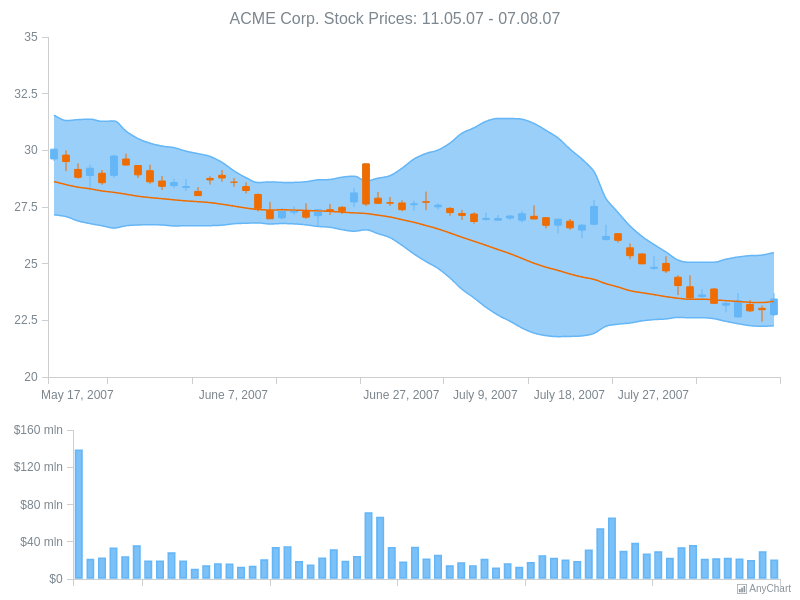 ACME Corp PricesFinancial Dashboard with 2 charts: the first one with 3 series of Range Area, Spline and Japanese Candlestick types and only a column chart on the second one. All these series display information about ACME Corp. Stocks prices and trades. 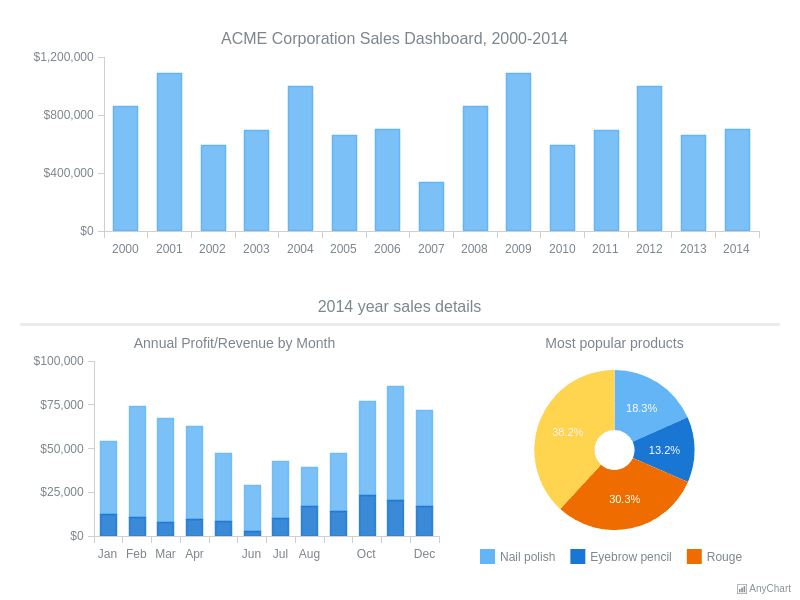 ACME Corp Sales DashboardDashboard with three charts: column chart, stacked column chart and pie chart. First chart is interactive and clicking on columns changes the second and the third charts. The dashboard displays company profit details for fourteen years. 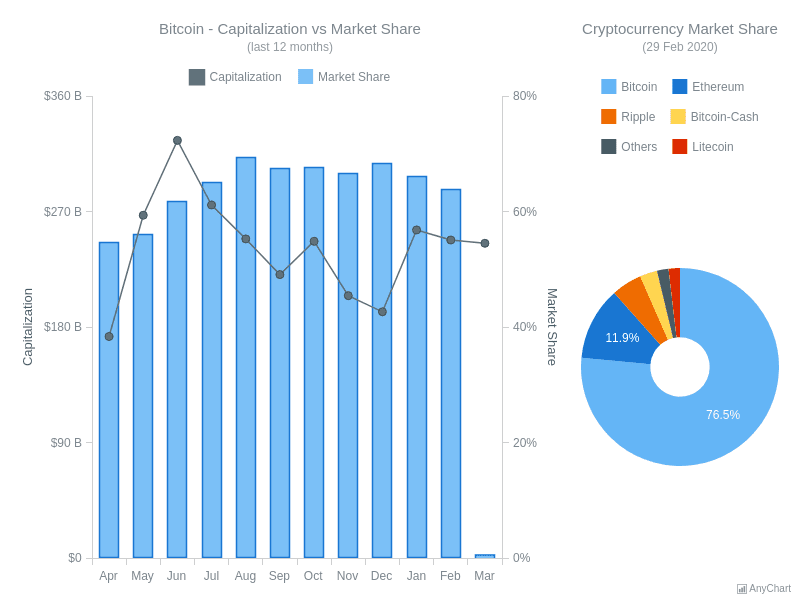 Bitcoin - Capitalization vs Market ShareBitcoin Dashboard example displaying the capitalization of BTC and its dominance in the market of cryptocurrencies as compared with ETH, BCH, XRP, LTC, and others. The dashboard is based on real data updated daily. CIO DashboardCIO dashboard from 'Information Dashboard Design. Displaying data for at-a-glance monitoring' by Stephen Few. Sample shows how AnyChart can be used to create complex visualizations. 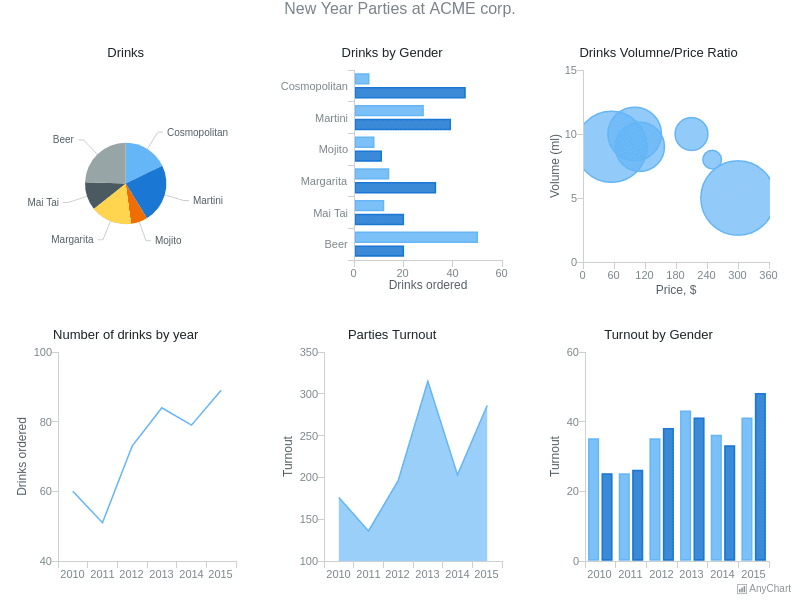 Multiple Charts at StageDashboard with six charts with information on New Year's parties of ACME Corp. 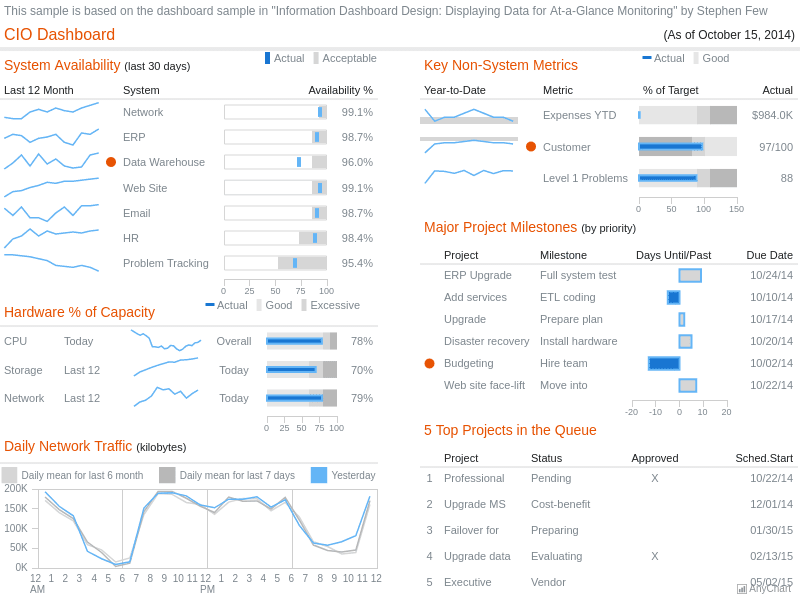 The main purpose of this dashboard is to demonstrate general appearance of a simple dashboard. 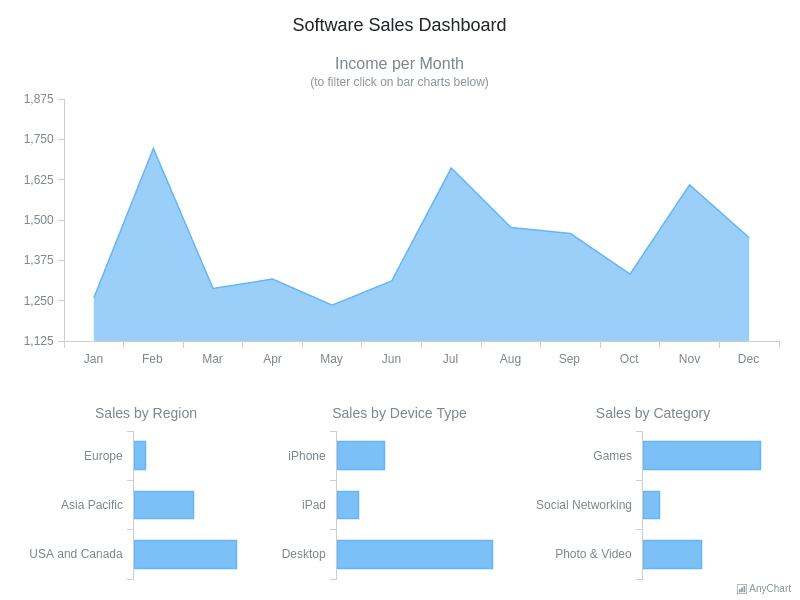 Software Sales DashboardDashboard with 4 charts: area chart and bar charts. Area chart displays the sales and bar graphs give information about software distribution according to type, region or device type. All bar charts are interactive and used as filtering UI elements.